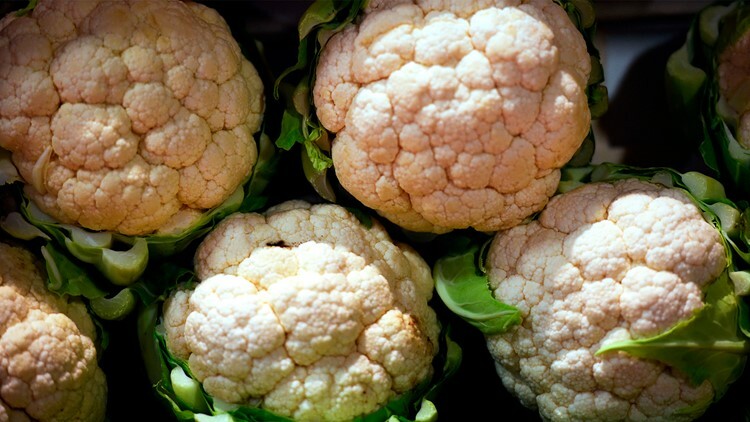 A picture taken on February 26, 2015 shows cauliflowers during the Paris international agricultural fair at the Porte de Versailles exhibition center in Paris. The California farm identified as one possible source of an E. coli outbreak that sparked a nationwide recall of romaine lettuce recalled red leaf lettuce, green leaf lettuce and cauliflower on Thursday. Adam Bros. Farming in Santa Maria, Calif. recalled the vegetables harvested between Nov. 27 and Nov. 30 out of an "abundance of caution" because they maybe have been contaminated with E. coli. The company said in a press release that none of the products had tested positive for E. coli and no illnesses had been reported. It said it had notified its effected customers. The new recall came on the same day when U.S. health officials announced that Adam Bros. Farming was a possible source for an E. coli outbreak from romaine lettuce. But they cautioned Thursday that other farms are likely involved in the E. coli outbreak and consumers should continue checking the label before purchasing romaine lettuce. The Food and Drug Administration said 59 people in 15 states have now been sickened by the tainted lettuce. That's seven more cases than previously reported, but regulators said they are fairly confident that the lettuce which first triggered the outbreak has been removed from the market. The FDA told consumers to avoid romaine lettuce just before Thanksgiving. Officials said a water reservoir at Adam Bros. Farms tested positive for the bacterial strain and the owners are cooperating with U.S. officials. Officials from the FDA and the Centers for Disease Control and Prevention have not determined how the water reservoir — which is used to irrigate lettuce — became contaminated. The FDA's Dr. Stephen Ostroff said investigators have linked the tainted lettuce to multiple distributors and processors, suggesting it must have come from several farms. A man who answered the phone at Adam Bros. Farms said he could not comment on the government announcement. According to the company's website, it only grows vegetables products, including broccoli, cauliflower, celery and various types of lettuce. The government also narrowed the source of the outbreak to three California counties: Santa Barbara, Monterey and San Benito. That's down from six California counties under investigation when regulators began warning the public last month. Romaine harvesting recently began shifting from California's Central Coast to winter growing areas, primarily Arizona, Florida, Mexico and California's Imperial Valley. Those winter regions weren't yet shipping when the illnesses began.